This article is about the federal territory and the homonymous island in Malaysia. For other uses, see Labuan (disambiguation). For the federal constituency represented in the Dewan Rakyat, see Labuan (federal constituency). For three centuries from the 15th century, the north and west coast of Borneo including the island of Labuan was part of the Sultanate of Brunei. In the 18th century, Labuan attracted British interest. James Brooke acquired the island for Britain through the Treaty of Labuan with the Sultan of Brunei, Omar Ali Saifuddin II on 18 December 1846. 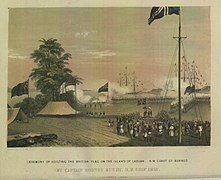 A British naval officer, Rodney Mundy, visited Brunei with his ship HMS Iris to keep the Sultan in line until the British Government made a final decision to take the island and he took Pengiran Mumin to witness the island's accession to the British Crown on 24 December 1846. Some sources state that during the signing of the treaty, the Sultan had been threatened by a British navy warship ready to fire on the Sultan's palace if he refused to sign the treaty while another source says the island was ceded to Britain as a reward for assistance in combating pirates. The main reason why the British acquired the island was to establish a naval station to protect their commercial interest in the region and to suppress piracy in the South China Sea. The British also believed the island could be the next Singapore. The island became a Crown Colony in 1848 with James Brooke appointed as the first governor and commander-in-chief, with William Napier as his lieutenant-governor. In 1849, the Eastern Archipelago Company became the first of several British companies to try to exploit Labuan coal deposits. The company was formed to exploit coal deposits on the island and adjacent coast of Borneo but soon became involved in a dispute with James Brooke. Not proving itself a great commercial or strategic asset, administration of Labuan was handed to the British North Borneo Company in 1890. In 1894, a submarine communications cable was built by the British to link the island's communications with North Borneo, Singapore and Hong Kong for the first time. By 30 October 1906, the British Government proposed to extend the boundaries of the Straits Settlements to include Labuan. The proposal took effect from 1 January 1907. In World War II, Labuan was occupied by Japan from 3 January 1942 until June 1945 and garrisoned by units of the Japanese 37th Army, which controlled Northern Borneo. The island served as the administrative centre for the Japanese forces. During the occupation, the Japanese Government changed the island name to Maida Island (前田島 [Maeda-shima]) on 9 December 1942 after Marquis Toshinari Maeda, as a remembrance to the first Japanese commander in northern Borneo. Maeda was killed in an air crash at Bintulu, Sarawak when en route to the island to open the airfield there. As the Allied counter-attack came closer, the Japanese also developed Labuan and Brunei Bay as a naval base. The liberation of Borneo by the Allied forces began on 10 June 1945 when the Australian Army under the command of Australian Major General George Wootten launched an attack under the codename of Operation Oboe Six. Labuan became the main objective for the Allied forces to repossess. 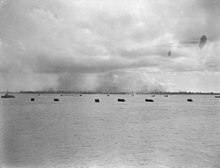 Soon, the 9th Division of the Australian Army launched the attack with support from airstrikes and sea bombardments until the capture of the Labuan airstrip. Most of the Labuan island area including the main town of Victoria was under the control of Allied forces within four days of the landing on 10 June. On 9 September 1945, the Japanese Lieutenant General Masao Baba officially surrendered at a place now known as Surrender Point near the Layang-layang beach which he had been brought to the 9th Division headquarters on the island to sign the surrender document in front of the Australian 9th Division Army Commander George Wootten. A post office was operating in Labuan by 1864, and used a circular date stamp as postmark. The postage stamps of India and Hong Kong were used on some mail, but they were probably carried there by individuals, instead of being on sale in Labuan. Mail was routed through Singapore. From 1867, Labuan officially used the postage stamps of the Straits Settlements but began issuing its own in May 1879. Although initially the design for the first stamp issue was proposed to be depicting a clump of sago palms, for economic reasons, the queen heads design was finally adopted, having been used initially for postage stamps of Grenada. The first stamps of Labuan therefore depict the usual profile of Queen Victoria but are unusual for being inscribed in Malay-Arabic (Jawi) and Chinese scripts in addition to "LABUAN POSTAGE". Perennial shortages necessitated a variety of surcharges in between the several reprints and colour changes of the 1880s. The original stamps were engraved, but the last of the design, in April 1894, were done by lithography. Beginning in May 1894, the stamps of North Borneo were overprinted "LABUAN". On 24 September 1896, the 50th anniversary of the cession was marked by overprinting "1846 / JUBILEE / 1896" on North Borneo stamps. Additional overprints appeared through the 1890s. In 1899 many types were surcharged with a value of 4 cents. The last Labuan-only design came out in 1902, depicting a crown and inscribed "LABUAN COLONY". After incorporation into the Straits Settlements in 1906, Labuan ceased issuing its own stamps, although they remained valid for some time. Many of the remainder were cancelled-to-order for sale to collectors and are now worth only pennies; genuine franked/post used stamps are worth much more. 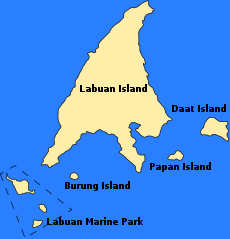 A map of Labuan island including the outlying islands. Labuan's area comprises the main island (Labuan Island – 91.64 square kilometres or 35.38 square miles) and six other smaller islands, Burung, Daat, Kuraman, Big Rusukan, Small Rusukan and Papan island with a total area of 91.64 square kilometres (35.38 square miles). The islands lie 8 kilometres (5.0 miles) off the coast of Borneo, adjacent to the Malaysian state of Sabah and to the north of Brunei Darussalam, on the northern edge of Brunei Bay facing the South China Sea. Labuan Island is mainly flat and undulating; its highest point is Bukit Kubong at 148 metres (486 feet) above sea level. Over 70% of the island is still covered with vegetation. The main town area of Victoria is located in a position facing Brunei Bay. Labuan has a tropical rainforest climate with no dry season. Over the course of a year, the temperature typically varies from 25 to 32 °C (77 to 90 °F) and is rarely below 24 °C (75 °F) or above 33 °C (91 °F). The warm season lasts from 1 April to 13 June with an average daily high temperature above 31 °C (88 °F). The hottest day of the year is 29 April, with an average high of 32 °C (90 °F) and low of 26 °C (79 °F). The cold season lasts from 7 January to 17 February with an average daily high temperature below 30 °C (86 °F). The coldest day of the year is 8 September, with an average low of 25 °C (77 °F) and high of 31 °C (88 °F). The weather station for Labuan is located at Labuan Airport. Thunderstorms are the most severe precipitation observed in Labuan during 60% of those days with precipitation. They are most likely around October, when they occur very frequently. Meanwhile, the relative humidity for Labuan typically ranges from 63% (mildly humid) to 96% (very humid) over the course of the year, rarely dropping below 53% and reaching as high as 100% (extremely humid). According to Malaysia's Department of Statistics, Labuan population for 2010 was at 86,908 and it is projected to be at 91,300 for 2013. In 2015, the population was reported to be at 96,800, surpassing the 2013 estimate. The ethnic composition in 2010 in Labuan was: Brunei Malay and Kedayan (30,001), Kadazan-Dusun (7,380), Bajau (6,300), Murut and Lun Bawang/Lundayeh (701), Chinese (10,014), Indian (641), Other ethnic (19,727) and non-Malaysian citizen (12,144). The majority of Chinese people in Labuan are from the Hokkien dialect group; however, there are also many Hakkas, most of whom are migrants or descendants of migrants from Sabah. As of 2010[update] Census the population of Labuan is 76.0% Muslim, 12.4% Christian, 9.0% Buddhist, 0.4% Hindu, 2.1% follower of other religions, and 0.1% non-religious. The economy of Labuan thrives on its vast oil and gas resources and international investment and banking services. Labuan is a very much an import-export oriented economy. Virtually all of its commodities including crude oil, methanol, HBI, gas, flour, animal feed, sea products and ceramic tiles are exported either to Peninsular Malaysia or overseas. Raw materials, parts and equipments for industrial uses well as consumer products are imported. In 2004, the total value of Labuan's external trade reached MYR11.8 billion from only MYR5.0 billion in 1995 for a net trade surplus of MYR5.1 billion. Among its major trade partners are India, Peninsular Malaysia, Sarawak and South Korea. 65% of its exports are petroleum and gas-based products. The Gross Domestic Product (GDP) of Labuan is estimated at MYR3.63 billion in 2012 with a growth rate of 5.8 percent. Labuan GDP per capita in 2012 is MYR39,682. The total employment for Labuan is around 39,800 in 2012. The main economic sectors in Labuan is service and manufacturing which contributed 94.6 percent to the island GDP. The service sector consisted mainly of Finance and Insurance and Real Estate and Business Services. Meanwhile, the manufacturing sector consists mainly of oil and gas industry and support. The Labuan International Business and Financial Centre Labuan IBFC was created as Malaysia's only offshore financial hub in October 1990 and was operating under the name of Labuan International Offshore Financial Centre (IOFC). At the time it was established to strengthen the contribution of financial services to the Gross National Product (GNP) of Malaysia as well as to develop the island and its surrounding vicinity. 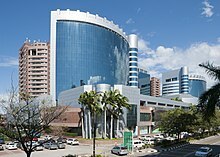 The jurisdiction, supervised by the Labuan Offshore Financial Services Authority or LOFSA, offers benefits such as 3% tax on net audited results or a flat rate of Malaysian Ringgit (MYR) 20,000 to trading companies; low operational costs; liberal exchange controls; and a host of other advantages including readily available, experienced and professional service providers. In 2010 the notion "offshore" was excluded from all the statutes of Labuan due to world pressure on the tax havens and offshores. Labuan is one of the Malaysian federal government territories. The island is administered by the federal government through the Ministry of Federal Territories. Labuan Corporation is the municipal government for the island and is headed by a chairman who is responsible for development and administration of the island. Labuan has one representative in each of the Lower and Upper Houses of Parliament. Typically, the current member of parliament of Labuan will be appointed to become chairman of Labuan Corporation. Security is the responsibility of the federal government, with naval patrol vessels, a garrison and an air detachment based on the island. The vigilance of the local Coast Guard and Customs and Excise contribute to the maintenance of Labuan's reputation and status as an international offshore financial centre and free trade zone. There are several attractions and places of interest on Labuan. The Labuan War Cemetery contains various war graves and memorials to the fallen of World War II. This includes British, Australian, Indian, Sarawakian, Bruneian, North Borneo and Empire troops, making it the largest war grave with 3,908 graves of fallen soldiers. A memorial service is held on Remembrance Day once every 4-year. There is also a memorial celebrating the surrender of the Japanese to the Australian Forces in 1945. There are also remnants of Labuan's history as a Royal Navy coaling station, including the chimney, a well known local landmark. There is also a Labuan Maritime Museum. Labuan is also the base for diving on four popular wreck dives: the Cement wreck, the American wreck, (the first USS Salute), the Australian wreck and the Blue Water wreck. Labuan has many schools. However, it has only one international school, Labuan International School. Other places of interest include the Labuan International Sea Sport Complex. Newly proposed is the Marina centre and Labuan Square project which are completed in 2010. Labuan's own institution of higher education is Universiti Malaysia Sabah Labuan International Campus, a branch of Universiti Malaysia Sabah in Sepanggar Bay, Kota Kinabalu. Labuan also has a matriculation college, Kolej Matrikulasi Labuan, the only matriculation college in East Malaysia. Thus, all pre-university students from Sabah, Sarawak and Labuan will take their courses here. Yussof Mahal, politician from Barisan National party and former Member of Parliament for Labuan. Rozman Datuk Hj. Isli, is the Member of Parliament of Labuan after the 2018 general election. Kelvin Teo, young entrepreneur and season 1 winner of reality show Love Me Do. Suresh Singh, right-hand bowler who plays for Malaysian cricket national team. ^ Geographical Dictionary of the World. Concept Publishing Company. pp. 1926–. ISBN 978-81-7268-012-1. ^ "Preliminary Count Report 2010". Department of Statistics, Malaysia. p. 27. Archived from the original on 8 July 2011. Retrieved 24 January 2011. ^ "Federal Territory of Labuan @ a Glance". Department of Statistics, Malaysia. Retrieved 29 December 2017. ^ Bradbury & Evans (1856). "Crawfurd, John, A descriptive dictionary of the Indian islands & adjacent countries". London: Columbia University Libraries. p. 203. Retrieved 29 April 2014. ^ a b c d e f g h i j k l Stephen R. Evans; Abdul Rahman Zainal; Rod Wong Khet Ngee (1996). The History of Labuan Island (Victoria Island) (PDF). Calendar Print Pte Ltd. ISBN 981-00-7764-5. Archived from the original (PDF) on 1 July 2013. ^ a b R. W. McColl (1 January 2005). Encyclopedia of World Geography. Infobase Publishing. pp. 123–. ISBN 978-0-8160-7229-3. ^ a b c d Rozan Yunos (7 September 2008). 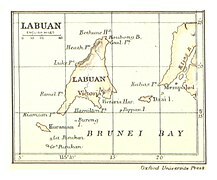 "Loss of Labuan, a former Brunei island". The Brunei Times. Archived from the original on 28 April 2014. Retrieved 29 April 2014. ^ a b "Opening of the New Colony of Labuan". Sydney Daily Advertiser. National Library of Australia. 23 September 1848. Retrieved 29 April 2014. ^ a b Philip Mathews (28 February 2014). Chronicle of Malaysia: Fifty Years of Headline News, 1963–2013. Editions Didier Millet. pp. 15–. ISBN 978-967-10617-4-9. ^ a b Alexander Wood Renton; Maxwell Anderson Robertson; Frederick Pollock; William Bowstead (1908). Encyclopædia of the laws of England with forms and precedents by the most eminent legal authorities. Sweet & Maxwell. ^ a b United States. Hydrographic Office (1917). Asiatic Pilot: The coasts of Sumatra and the adjacent straits and islands. Hydrographic office under the authority of the secretary of the navy. ^ a b Paul H. Kratoska (2001). South East Asia, Colonial History: Peaceful transitions to independence (1945–1963). Taylor & Francis. pp. 129–. ISBN 978-0-415-24784-9. ^ a b "Laws of Malaysia A585 Constitution (Amendment) (No.2) Act 1984". Government of Malaysia. Department of Veterinary Services. Archived from the original on 29 April 2014. Retrieved 28 April 2014. ^ a b Graham Saunders (5 November 2013). A History of Brunei. Routledge. pp. 78 & 123. ISBN 978-1-136-87394-2. ^ B.A. Hussainmiya (2006). 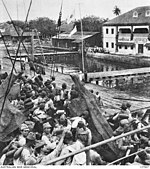 "Brunei Revival of 1906 (A Popular History) – The Surrender of Labuan and The First Brunei-British Treaty" (PDF). Brunei Press Sdn Bhd. Bandar Seri Begawan: Universiti Brunei Darussalam. pp. 12/34. ISBN 99917-32-15-2. Archived from the original (PDF) on 12 September 2014. Retrieved 29 April 2014. ^ W. H. Treacher, C.M.G. M.A. Oxon (1891). "British Borneo: Sketches of Brunai, Sarawak, Labuan and North Borneo" (PDF). University of California Libraries. Trinity Theological College. pp. 12 / Chapter VI. Pages 84–92. Archived from the original (PDF) on 11 October 2013. Retrieved 29 April 2014. ^ Henry Keppel (2009). 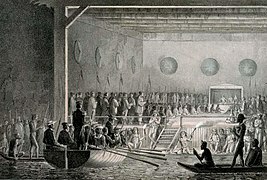 The Expedition to Borneo of H. M. S. Dido: 1843 – 1846. BoD – Books on Demand. pp. 304–. ISBN 978-3-941842-95-3. ^ "The Straits Times, 14 October 1848, Page 3 (Labuan)". National Library Board. 14 October 1848. p. 3. Retrieved 29 April 2014. ^ "The Straits Times, 21 October 1848, Page 3 (Labuan)". National Library Board. 21 October 1848. p. 3. Retrieved 29 April 2014. ^ Rodney Mundy; James Brooke (1848). Narrative of events in Borneo and Celebes, down to the occupation of Labuan: from the journals of James Brooke, Rajah of Sarãwak, and governor of Labuan, together with a narrative of the operations of H.M.S. Iris. Murray. pp. 367–. ^ Phillip Cottrell (25 May 2012). Investment Banking in England 1856–1881(Rle Banking and Finance). Routledge. pp. 211–. ISBN 978-0-415-53020-0. ^ Eastern Archipelago Company (1853). The Queen on the Prosecution of Sir James Brooke, K.C.B. Against the Eastern Archipelago Company; Containing the Judgments of the Queen's Bench and the Exchequer Chamber, Together with Two Articles from the "Times" Newspaper, Etc. W. Clowes & Sons. pp. 9–. ^ Eastern Archipelago Company. Annual Report of the Directors of the Eastern Archipelago Company. Eastern Archipelago Company. pp. 149–. ^ James Stuart Olson; Robert Shadle (1996). Historical Dictionary of the British Empire. Greenwood Publishing Group. pp. 645–. ISBN 978-0-313-29367-2. ^ Frans Welman. Borneo Trilogy Volume 1: Sabah. Booksmango. pp. 162–. ISBN 978-616-245-078-5. ^ "Staying connected". The Star. 16 January 2012. Archived from the original on 29 April 2014. Retrieved 30 April 2014. ^ T. A. Edwin Gibson; G. Kingsley Ward (1989). Courage remembered: the story behind the construction and maintenance of the Commonwealth's military cemeteries and memorials of the wars of 1914–1918 and 1939–1945. McClelland & Stewart. ISBN 978-0-7710-8786-8. ^ a b Keat Gin Ooi (October 2004). Southeast Asia: a historical encyclopedia, from Angkor Wat to East Timor. ABC-CLIO. ISBN 978-1-57607-770-2. ^ a b Stanley Sandler (January 2001). World War II in the Pacific: An Encyclopedia. Taylor & Francis. pp. 181–182. ISBN 978-0-8153-1883-5. ^ James O'Connor (13 June 1945). "Australians Swarm Ashore on N-W Borneo Coast". The Morning Bulletin. National Library of Australia. Retrieved 30 April 2014. ^ Australian Officials (19 June 1945). "Capture of Labuan Airstrip in Borneo". The Sydney Morning Herald. National Library of Australia. Retrieved 30 April 2014. ^ "Surrender Point Memorial, Labuan Island". Department of Veterans' Affairs. 19 November 2012. Archived from the original on 1 May 2014. Retrieved 1 May 2014. ^ "Chapter 8: Labuan International Offshore Financial Centre". Bank Negara Malaysia. Archived from the original on 2 May 2014. Retrieved 1 May 2014. Labuan was declared as an International Offshore Financial Centre (IOFC) in October 1990 to complement the activities of the domestic financial market in Kuala Lumpur, strengthen the contribution of financial services to Gross National Products of Malaysia as well as develop the island and areas within its vicinity. ^ "Labuan Stamps". The Stamps Journal. Retrieved 2 June 2016. ^ https://web.archive.org/web/20180303052114/http://www.stampworldhistory.com:80/country-profiles-2/asia/labuan/ Retrieved 12 August 2018. ^ a b "Average Weather for Labuan". WeatherSpark. Retrieved 21 January 2014. ^ "Labuan Climate Normals 1961–1990". National Oceanic and Atmospheric Administration. Retrieved 24 March 2015. ^ "Klimatafel von Labuan / Insel Borneo (Kalimantan) / Malaysia" (PDF). Baseline climate means (1961–1990) from stations all over the world (in German). Deutscher Wetterdienst. Retrieved 17 October 2016. ^ "Station Labuan" (in French). Meteo Climat. Retrieved 14 October 2016. ^ "2010 Population and Housing Census of Malaysia (Labuan)" (PDF) (in Malay and English). Department of Statistics, Malaysia. Archived from the original (PDF) on 11 October 2012. Retrieved 17 June 2012. ^ a b "Demographic Indicator Malaysia 2013" (PDF) (in Malay and English). Department of Statistics, Malaysia. Archived from the original (PDF) on 2 February 2014. Retrieved 21 January 2014. ^ "Labuan Economy". Labuan Liberty Port Management. Retrieved 20 January 2014. ^ "GDP by state, national accounts 2005–2012" (PDF) (in English and Malay). Department of Statistic, Malaysia. Archived from the original (PDF) on 26 November 2013. Retrieved 20 January 2014. ^ "School". Labuantourism.com.my. Archived from the original on 22 February 2012. Retrieved 21 February 2012. ^ "Laman Web Rasmi Universiti Malaysia Sabah Kampus Antarabangsa Labuan". Al.ums.edu.my. Retrieved 21 February 2012. An inscription about the new clock tower. Labuan Story: Memoirs of a Small Island near the Coast of North Borneo (1958) Maxwell Hall Jesselton, North Borneo: Chung Nam.